Please note - The Bridge Course Calendar is currently only available for use by EBTA teachers. Additionally the calendar should only be used for regular bridge learning courses for students NOT one off events or bridge holidays. EBED reserves the right to delete events which do not meet the stipulated criteria. In order to add your classes to our Calendar, you must have a Google account. If you use Gmail or have an Android smartphone, you will already have one. If you don't currently have a google account click here for instructions on setting one up. 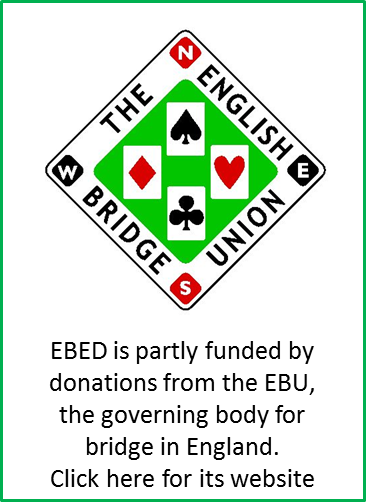 E-mail calendar@ebedcio.org.uk providing the e-mail address for your Google account, your EBU Number and the club you are associated with. You will receive a reply once you have been set up as a user in your region. Go to www.google.co.uk. Click on the icon in the top right hand corner made up of nine little squares, then click on Calendar. You will be prompted to log in to your Google account if you are not already logged in. •	Click on the date of your first lesson. •	Add the title for your class beginning with the name of your bridge club. •	Click on "Add time" to add timings. •	Use the drop down menu below to select the "Bridge Classes" calendar. If you don't select the Bridge Class calendar, classes will be added to your personal calendar and not the public "Bridge Classes" one. •	Next click on "More options". •	To make your class a repeating event, click on "Does not repeat" and then on "Custom". •	Specify how many weeks the event is to repeat for or repeat on a different cycle such as fortnightly. •	Once you have set up a repeating event, you can move individual sessions for one-off changes such as day or time. •	Next add a description of your class, including venue information, contact details, who the class is aimed at or any other information you'd like to appear. 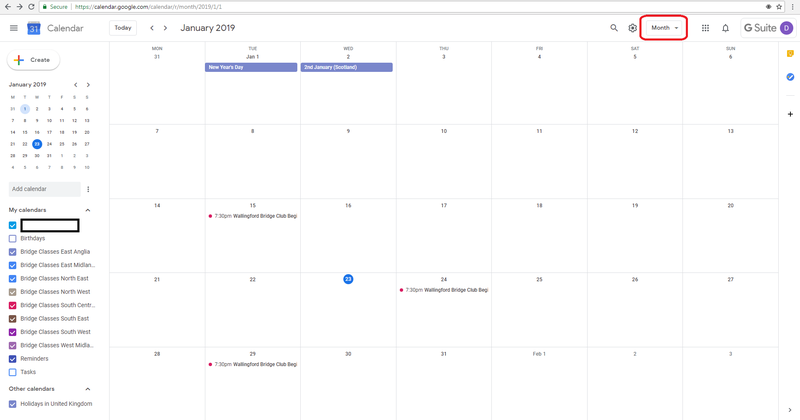 You will return to the calendar screen and your classes will show both there and on the EBED public club course calendar. You can choose to create a new Gmail e-mail address or simply use any existing e-mail address as your username. If you choose an existing e-mail address, You will need to be able to access it so that you can verify that it belongs to you. You will also need access to a phone as Google will send a text message to a phone number that you provide as another way to verify your account. Don't worry if you only have a landline - you can still receive a text message, it will be read out by an automated system when you pick up the phone. If this doesn't work, there is also an option to be called instead of being sent a text message. Click here and follow the instructions as they appear on each page to set up your account. Once your account is activated, scroll back up this page or click here for instructions on adding your classes to the calendar.